We’ve got quite a few photos for this week – that’s because we happen to have this week represented in almost every year of the Whistler Question Collection! Kayakers are dwarfed by the Daisy Lake Dam. Werner Furrer (third place K1) explodes over waves, heading for gate 28. The finished product – a distinctive Zurbrugg chalet. Asphalt oil heater is lifted off a lowbed at Malloch & Mosley on Friday as Doug Muir looks on. The new municipal waterworks tank above the Town Centre. FIRE on Blackcomb! The scene from Alpine Meadows at 11:30 pm on Sunday. The Whistler Volunteer Firemen practice – John Howells up a ladder. Architect’s drawing of the new Whistler Tri-Service Building. Parcel 16 will have a clock tower rising from the right hand side and will feature retail outlets on the first floor and residential on the second. Most work in town centre is construction but some is destruction. These two workers pound away at steel-reinforced concrete. A day long job for sure. The giant twin-propellor Canadian Forces Rescue helicopter used to help rescue crews get to the crash site of a small plane on Whistler Mountain. Roof gone and the rest going, this old mill is deteriorating along the Green River north of Whistler. Only ghosts and rodents inhabit it now. Whistler Village parking! Wagon misses the parking lot on Wednesday evening, ending up in the newly landscaped garden. Herb and Jean Hepburn of Okanagan Produce, Vernon, managed to get in a few fruit sales before being asked to leave by municipal authorities. Bob Dawson and Neil Mawdsley unsuccessfully try to get a fly ball. Chris Green, Laura d’Artois and J.G. Luckhurst at the Fireplace Inn opening party. And here he is! The mysterious Mr B.A. Bell of Whistler slowly unpeels his talent – much to the giggles and appreciation of his audience at the first Jock Contest held at Mountain House, July 20. With competition from Fast Eddie and Schultz, things looked mighty tough – but then Peter Lamare took the floor and the $100 first prize. Annette Ducharma, accompanied by Jamie Boyd, strummed out many a fine tune at JB’s July 16 – 20 while Betsy Chaba took a temporary leave to entertain folks at the Folk Festival in Vancouver. Crews replace railroad crossing on the highway by the Whistler Industrial Park. Workers repair damage done to the Lillooet bridge, which received unwanted alterations Tuesday from a truck too tall for a bridge too small. Hanging high, window washers polish up the Delta Mountain Inn for its July 23rd opening. Rotarians enjoy their Bravery Luncheon July 16. They were guests of Delta Mountain Inn, which was giving its Twigs Restaurant staff a taste of the dining room in action. Virginia Meachin enjoys an early morning cup of java with two hikers who joined her Saturday hike down Whistler Mountain. Whistlerites enjoy some of the gourmet treats served by the Gourmet, which recently completed its patio eating area outside of the Rainbow building in Sunshine Place. Halt! A barrier blocks the drive of an Alpine Meadows residence after the ditching crew passed by. Fresh off the assembly line is the Municipality’s 4×4 multi-purpose truck. Among other chores the vehicle will tackle the job of plowing Whistler streets this winter. Sunny skies and the colourful show put on by the Estonian Folk Dancers of Vancouver brightened up the Whistler Village Sunday, July 17. Paul Gibson of Selkirk Cable Vision turns a final screw to get Alpine Meadows booked into Whistler Cable Television’s system. Besides six channels, subscribers can now enjoy a host of FM radio stations. When weekend temperatures soared to the mid-20s, sun worshippers who had been denied their pleasure for nearly six weeks flocked to Lost Lake like the swallows to Capistrano. The new forecast, after four days of sun? Get out the ark, and don’t ask again. Thuy Read admires a shirt from Whistler Tops in her role asa shopper in “Getaway to Whistler”, a promotional film being made by Curtis Petersen of Petersen Productions. You put your knees up and you toss the cool drinks down when the sun comes out at Whistler. Temperatures climbed as high as 30.4 C in the past week. Even at the Toni Sailer Ski Camp there were hot times. On Monday at noon the temperature at Midstation on Whistler Mountain was 21 C.
Despite their best efforts, Stoney’s lost 14-1 to the Suds squad. It was the annual Rotary Installment last Wednesday at Sid Young’s house in Alpine Meadows overlooking 19 Mile Creek. Rotarians and guests were feted with steak prepared by Rudi Hoffmann and lobster, flown in from Nova Scotia, boiled by Ted Nebbeling. District Governor Ralph Crawford also installed Sid Young as the service organization’s new president, taking over from Geoff Pearce. As well, Floyd Eclair becomes vice-president, Doug Fox secretary, Nick DiLalla sergeant-at-arms, Walter Zebrowski treasurer, Arv Pellegrin club service director, Brian Brown youth and international service director and Jon Paine vocation service director. We recently announced our upcoming Speaker Series on May 6th, celebrating 50 years of summer camps. The inclusion of Nancy Greene-Raine on the speaking panel quickly made it apparent that, although we have decent coverage of her husband Al Raine’s contributions to Whistler on this blog (plus here), up until now, Nancy’s presence is notably lacking. This blog post will start to fix that problem. Though Nancy was born in Ottawa, grew up in the Kootenay ski haven of Rossland, BC with its historic Red Mountain Resort, and has lived in Sun Peaks for roughly two decades, her connection and contributions to Whistler remain strong. Nancy, of course, is one of the most recognized and celebrated Canadian athletes of all-time, regardless of discipline, even earning the title of Canadian Female Athlete of the Century! She was the most dominant female ski racer of the 1960s, earning 13 World Cup victories, 2 overall world titles, and her gold medal (and silver, all while battling a severe ankle injury) performance at the 1968 Grenoble Olympics, alongside French legend Jean-Claude Killy, is the stuff of legend. Here’s a complete run-down of her ski-racing accomplishments. 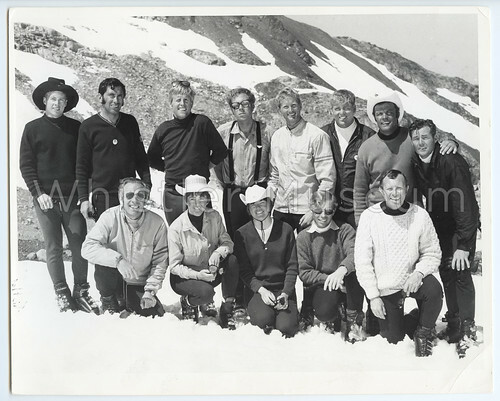 1969 Toni Sailer Summer Camp staff. Nancy is front row, 2nd from left, Toni Sailer is back row, 2nd from right, both wearing cowboy hats. Nancy retired at the top of her field and a global celebrity after her dominant 1968 season. Retirement from ski racing was no permanent vacation, as the pervious winter she had already launched her Nancy Greene Ski League, Canada’s national, grassroots-level ski racing program. In the nearly 50 years of operation, virtually every single Canadian ski racer of note, from Steve Podborski to Ashleigh McIvoor, and countless thousands of others, started competitive skiing in Nancy’s program. In 1969, she began coaching at Toni Sailer Summer Ski Camps on Whistler Mountain, a position she maintained for several years and which she will be recollecting at this Friday’s Speaker Series. Al and Nancy first built a cabin in Whistler in 1970, which was their summer home while Nancy coached on the glacier. Once Al retired as a ski coach in 1975, they moved to Whistler full-time and set out to help Whistler become a leading international ski destination. Nancy and her husband Al Raine also played a huge role in the early success of Whistler and their legacy carries on to this day. Nancy became an spokeswoman and ambassador for the resort, using her celebrity to promote the upstart ski area. As such, she was one of Whistler’s original “Celebrity-Athletes” that played such a pivotal role in Whistler becoming, well, Whistler. Al sat on the first municipal council and was a leading figure in the planning, design, and construction of Whistler Village and Blackcomb Mountain. Nancy and husband Al, representing Blackcomb Mountain (note the matching Blackcomb Mountain outfits, and Nancy’s Blackcomb logo name tag). circa 1980s. In 1985 they built Nancy Green’s Olympic Lodge in the heart of the Village, and despite having long since sold it, the building bear’s Nancy’s name to this day. In the 1990s, Al and Nancy moved on to Sun Peaks in the B.C. interior, but they still maintain close ties to Whistler. We are truly honoured to have Nancy join this Friday’s panel, and we hope you can join us. Get your tickets in advance, it will sell out! February 25, 1989 is a date that any long-time Whistlerite should remember, because on that day Rob Boyd became the first Canadian male to win a World Cup Downhill event on Canadian soil. It remains not only one of the most memorable days in our community’s history, but for Canadian ski fans as a whole. Not too long ago, we even had some visitors here to the Whistler Museum who recalled watching the race live on a black-and-white television in the lodge at Luggy Lump Ski Hill in St. John’s, Newfoundland. If that does not warm your heart with old-fashioned Canadian nostalgia, nothing will. Canadian National Ski Team. Boyd is far right. WMAS, Greg Griffith Photo. It was a triumphant moment not only for the historic achievement, but also because Canadian supporters were still reeling from the gruesome and nearly fatal crash that Boyd’s teammate Brian Stemmle had suffered at Kitzbuhel six weeks earlier. By this point Stemmle was back on the long road to recovery and everyone was keen for a reason to celebrate. If you watch the video clip of the CBC’s coverage of the race (available on YouTube), right after he crosses the finish line Boyd waves the cameraman over to get up close so that he can proudly announce “For you, Stemmle!” There’s also a pretty glorious cutaway to the raucous celebrations going on at Dusty’s. Here in Whistler it was a massive community event. Rob had moved to Whistler as a teenager in 1982, so he had huge local support. The medal ceremony drew one of the largest crowds ever assembled in Whistler up to that point and the party kept going for days. That evening a fundraiser was held at the Conference Center for the national ski team, featuring performances by Colin James and Smokey Robinson. Apparently the $125 event had not been selling well, but Boyd’s dramatic victory put everyone in the celebratory mood and all 1,800 tickets were eventually spoken for. It was a legendary party that included, among other things, the golden boy being gifted a pair of Dwight Yoakam’s cowboy boots that Boyd proceeded to brandish on the dance floor. Local boy Rob Boyd atop the podium, 25 February 1989. Greg Griffith Photo. This wasn’t Rob’s first World Cup gold medal, having won twice already at Val Gardena, Italy, but winning on home soil was certainly a career highlight. Rob still lives in Whistler and remains one of our town’s biggest heroes. Just a few weeks ago there was a huge party at Dusty’s Bar to celebrate Rob’s 50th birthday, a stone’s throw from the finish line where he won gold 27 years earlier. When he’s not celebrating birthdays you can find Rob coaching for the Whistler Mountain Ski Club. The club’s Creekside headquarters are easy enough to find, address: 2028 Rob Boyd Way.